CARIBE WAVE (Caribbean Tsunami Warning Exercise) is a tsunami exercise held annually in the Caribbean, including Puerto Rico and the Virgin Islands, under the direction of UNESCO and the Pacific Tsunami Warning Center (PTWC). Since 2016, this exercise has been carried out annually under the name CARIBE WAVE (Caribbean Tsunami Warning Exercise). In Puerto Rico, this exercise was held from 2009 to 2013 under the name LANTEX (Large Atlantic Tsunami Exercise); and in 2012, 2014 and 2015 under the name of CARIBEWAVE/LANTEX Joint Exercise (Caribbean and Northwestern Atlantic Tsunami Exercise). This year, 2018, marks a decade of tsunami exercises in Puerto Rico, which are under the leadership of the Puerto Rico Seismic Network, in coordination with the NOAA Tsunami Warning Centers, the Puerto Rico Emergency Management and Disasters Administration, the National Weather Service-San Juan Forecast Office (NWS-NOAA), the Federal Emergency Management Agency (FEMA), the EAS-Puerto Rico Committee, and the Puerto Rico Broadcasters Association, among others. The purpose of the CARIBE WAVE exercise is to improve the effectiveness of the Tsunami Warning System along the Caribbean region. The exercise provides an opportunity for emergency management organizations throughout the region to test their operational lines of communications, review their tsunami response procedures, and to promote tsunami preparedness. Regular exercises to test the response plans are essential to maintain adequate emergency preparedness. This is particularly true for the Caribbean, where tsunamis are rare, but can have a very high impact. We invite all emergency management organizations (EMO) to participate in this exercise. The objectives of the CARIBE WAVE Exercise are to test and evaluate the operations of the Caribbean Tsunami Warning System (Caribe EWS), to validate preparedness response to a tsunamis (which are test protocols and communications systems between tsunami warning centers and the tsunami warning focal points), and the use of the PTWC (Pacific Tsunami Warning Center) tsunami products for the Caribbean, as well as assist in tsunami preparedness efforts of the emergency management agencies in those areas. In the Puerto Rico and the Virgin Islands Region, this exercise is held under the leadership of the Puerto Rico Seismic Network (PRSN) and has counted on the participation of all emergency agencies within our area of responsibility year after year. CARIBE WAVE 2019 Exercise is held under the framework of the Intergovernmental Coordination Group for Tsunami and Other Coastal Hazards Warning System for the Caribbean and Adjacent Regions (ICG/CARIBE EWS) of the UNESCO Intergovernmental Oceanographic Commission (IOC), the National Oceanographic and Atmospheric Administration (NOAA) Tsunami Program, US National Weather Service (NWS) and other emergency agencies in the Caribbean Region (such as CEPREDENAC, CDEMA, and EMIZA). This tsunami exercise is being conducted to assist with tsunami preparedness efforts throughout the Caribbean Region. Recent tsunamis, such as those in the Indian Ocean (2004, 2018), Samoa (2009), Haiti (2010), Japan (2011) and Chile (2010, 2014, 2015), Honduras and Sulawesi (2018) attest to the importance of tsunami response proper planning. Although most tsunamis are generated by earthquakes, they may also be caused by submarines landslides, volcanic eruptions or impacts of celestial bodies. According to NOAA’s National Centers for Environmental Information (NCEI) over 105 tsunamis have been observed in the Caribbean over the past 500 years. Approximately, 4,500 people have lost their lives because of the tsunamis in the Caribbean. In addition to tsunamis, the region also has a long history of destructive earthquakes. Within the region there are multiple fault segments and submarine features that could be the source of earthquake and landslide generated tsunamis. The perimeter of the Caribbean plate is bordered by no fewer than four major plates (North America, South America, Nazca, and Cocos). Subduction occurs along the eastern and northeastern Atlantic margins of the Caribbean plate. Normal, transform and strike slip faulting characterize northern South America, eastern Central America, the Cayman Ridge and Trench and the northern plate boundary (Benz et al, 2011). In addition to the local and regional sources, the region is also threatened by far field tsunamis/transAtlantic tsunamis, like that of 1755 Lisboan Earthquake. 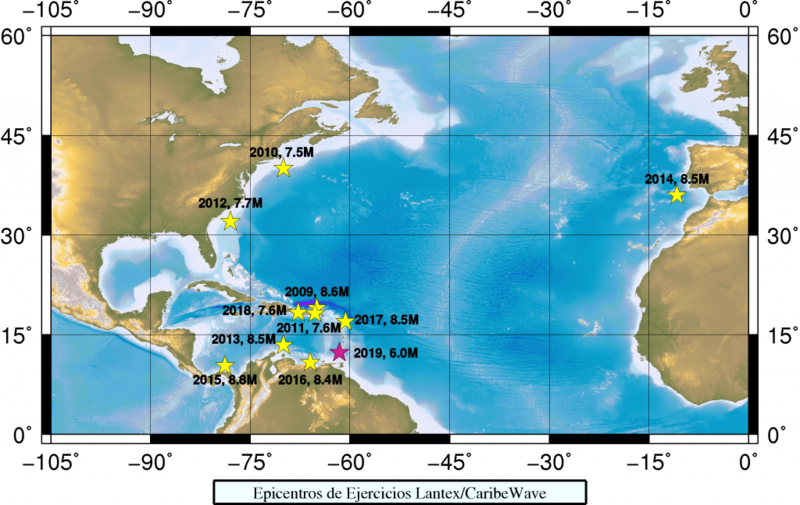 Six confirmed volcano tsunami source events and two landslides generated from volcanoes have affected the Caribbean and adjacent regions (ITIC y NCEI, 2018). For this reason, it will be tested for the first time a volcanic scenario for the 2019 exercise, using the Kick ’em Jenny Volcano as example. With nearly 160 million people (Caribbean, Central America and Northern South America) now living in this region and a major earthquake occurring about every 50 years, the question is not if another major tsunami will happen, but when it happens will the region be prepared for the tsunami impact. The risks of major earthquakes in the Caribbean, and the possibility of a resulting tsunami, are real and should be taken seriously.